Tropical cyclones are among the most hazardous natural disasters. With their intense rain, high winds, and associated storm surges they pose a severe threat to the coastal population in the tropics and subtropics. Less frequently, they cause severe damage in the midlatitudes also, with Hurricane Sandy in 2012 as a prime example. Reliable forecasts of these dangerous storms are essential to mitigate associated hazards. Forecasting storm intensity, however, poses an important challenge and fundamental scientific questions about the processes that modify storm intensity are still open. 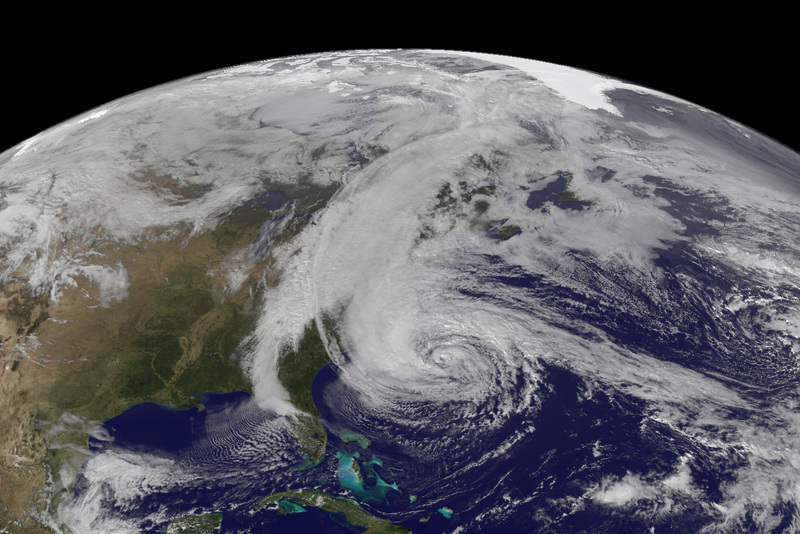 Left: Visible image of NOAA’s GOES-13 satellite of Hurricane Sandy (2012) approaching the US East Coast on Oct 28 at 1745 UTC. Source: NASA GOES Project. 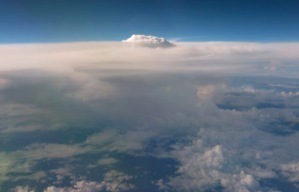 Right: Exceptionally strong convection overshooting into the stratosphere during the development of Hurricane Karl (2010). Source: Michael Riemer. The interaction with environmental winds that exhibit vertical shear plays an important role for intensity changes. This interaction promotes the intrusion of drier and cooler environmental air into the storm’s inner-core convection, so-called „ventilation“. This intrusion effectively reduces the ability of the storm to convert the heat of the underlying ocean surface into kinetic energy, i.e. high wind speeds near the storm center. Using idealized numerical experiments, our work has introduced a novel comprehensive framework to describe this shear interaction (Riemer et al. 2010, 2013; Riemer and Montgomery 2011; here summarized in the schematic). The formation of a distinct convective asymmetry outside of the storm’s eyewall – a so-called stationary band complex – is hypothesized to play a particularly important role and has been investigated in some detail (Riemer 2016). Schematic of the interaction of a tropical cyclone with vertical shear. Left: Vertical shear tilts the cyclone vortex (cylinder and dashed contours). Balanced vortex dynamics favor a tilt direction left of the shear vector. Storm-relative flow distorts the warm, moist air surrounding the inner core (red colors). Right: A stationary band complex develops due to the frictional convergence in a favorable thermodynamic environment. Associated ascent follows a helical path, precipitation falls in unsaturated air below, and strong downdrafts due to evaporative cooling flush cooler, drier air (blue colors) into the storm’s inflow layer. Currently, I am interested in the Lagrangian description of „ventilation“. Based on a coordinate transformation from physical to thermodynamic space, we presented a succinct diagnostic of „ventilation“ that allows a quantitative description of different pathways (Riemer and Laliberte, 2015). We prefer a thermodynamic (entropy-temperature) space over the 2D physical radius-height space because i) asymmetric storm structure makes radius as a coordinate rather ambiguous and ii) geometric height (or pressure-based vertical coordinates) provide no clear distinction between the frictional boundary layer, the outflow layer, and the free troposphere. Example of air parcels rising through the eyewall of a model tropical cyclone in vertical shear. Colors denote equivalent potential temperature, a measure of the heat and moisture content. Air parcels with low values are drawn into the updrafts, effectively weakening storm intensity. Riemer, M., 2016: Meso-beta-scale environment for the stationary band complex of vertically-sheared tropical cyclones, Quart. J. Roy. Meteor. Soc., 142(699), 2442-2451.